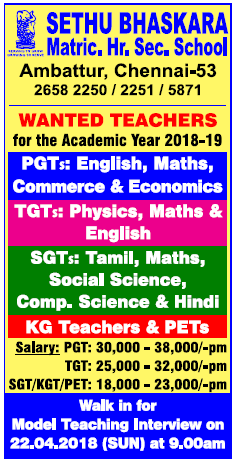 Sethu Bhaskara MHSS, Chennai has advertised in THE HINDU newspaper for the recruitment of PGT plus TGT plus SGT job vacancies. Interested and eligible job aspirants are requested to appear walk in on 22nd April 2018. Check out further more details below. About School: The School has obtained the official recognition of the Matriculation Board, the Board of Higher Secondary Education and the Government of Tamilnadu. It has a strength of 7500 students and 335 members of staff. The School magnanimously provides Free Education to about 250 deserving students every year.